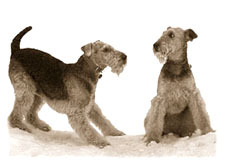 In order not to duplicate the vast efforts of other rescue organizations, we have provided links to some useful information you should read before deciding if an Airedale is the dog you really want, and what you can expect from a rescued dog. Sadly, some of these dogs come with baggage and require some very committed owners to help them deal with past trauma or behavioral problems. It is important that you are fully aware of what to expect before you decide to adopt. Over time, we will also include on this site, some articles and stories from our own volunteers, and updates on some of our Airedales that have gone on to their forever homes. Sidney Hardie’s Articles PagesDo You Think You Could Be A Foster Home?